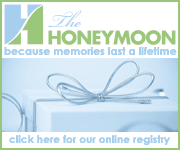 If you would like to give your wedding guests a gifting alternative to crock pots, toasters and blenders, we offer you the convenience of a fully automated, online honeymoon registry service. Your wedding guests can buy you gifts that deliver experiences like offshore excursions, tours, sport activities or amenities like beauty and spa services. If you would like more information or help setting one up, contact us. If you would like to set this up on your own, visit The Honeymoon to get started.